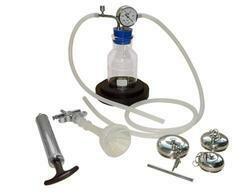 Backed by the rich industry experience, we offer to our clients Suction Apparatus. Our broad range entails Electric Suction Apparatus, Suction Apparatus Battery Operated, Vertical Foot Suction and many more. These instruments are to provide paramedical services in the remote areas and places with low or zero electricity supply. Our all paramedical devices are made of precision quality components to ensure precision finish and dimensional accuracy. We present new innovated models of laboratory and medical appliances in the market to meet the changing demands of the clients. Complete vacuum of vertical foot suction 600 mm hg. Suction Machine Manual foot operated Powder Coated Heavy MS Base 1500 ml Polycarbonate Jar with ABS Lid powder coated Metal Components ABS (Plastic) Piston Pump Aluminium Carrying Handle Non-Collapsible Suction Tubing unit provided with Pressure gauge, easy to clean jar and easy to sterile if needed hany unit can be used in indoor or out door like medical campus , ambulances etc. Open end glass jar of about 1500 ml. 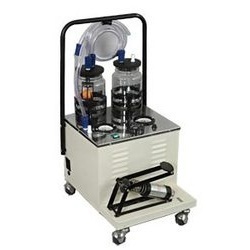 Suction Machine Manual foot operated Powder Coated Heavy MS Base 1500 ml x 2 glass jars with rubber Lid powder caoted Metal Components ABS (Plastic) Piston Pump Aluminium Carrying Handle Non-Collapsible Suction Tubing unit provided with Pressure gauge, easy to clean jar and easy to sterile if needed hany unit can be used in indoor or out door like medical campus , ambulances etc. 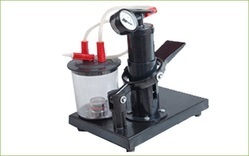 We offer to our clients Suction Apparatus Battery Operated. 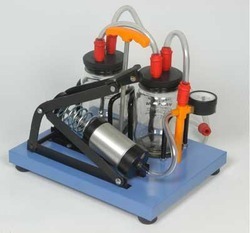 A suction apparatus is used to provide medical support services in the areas with infrequent power supply. 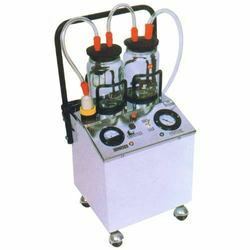 This variant of suction apparatus can be easily moved on Ambulance vehicle due to its battery operation. Moreover, the appliance can also be operated on 230 volts AC current. Our all devices are manufactured using premium grade material for high performance and long operation life.